We’re always on the lookout for things to keep us occupied and engaged when we’re away as a family in our beloved bell tent. So, when University Games asked us to try a range of their games we couldn’t resist. Despite most definitely being an all-weather family, we still need a range of activities for the tent itself. I’ll hold my hands up right now and admit to taking the iPad away with us when we camp with the kids. When they wake, at somewhere between 5:30am and 6am every morning, it’s a very convenient tool to have, believe me! But, what do we have up our sleeves for whole-family tent games? Furthermore, what do we play if we happen (God forbid) to get an hour’s peace in the evening once the kids are tucked up in their sleeping bags? Well, here are two new games that we love which are ideal to play in a tent. First of all, what do we look for in a family camping game? Well, the first thing is, it’s got to be easy to pack and transport with fewer little pieces than most board games. I can’t tell you how many times we’ve lost the poor old Monopoly Dog in our tent! Family camping games also need to be robust. As I have to jam everything into every last nook and cranny of the car, breakables need not apply. After that, the games need to be fairly simple. 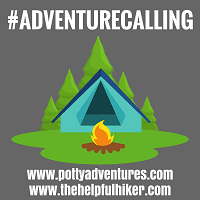 When we’ve spent a day hiking or canoeing, we don’t need something that going to give us brain-ache. Lastly, of course, they need to be fun. This looks like a pretty tall order but we think we’ve found a couple that suit both our family time and adult time. First up, we have Staccups. 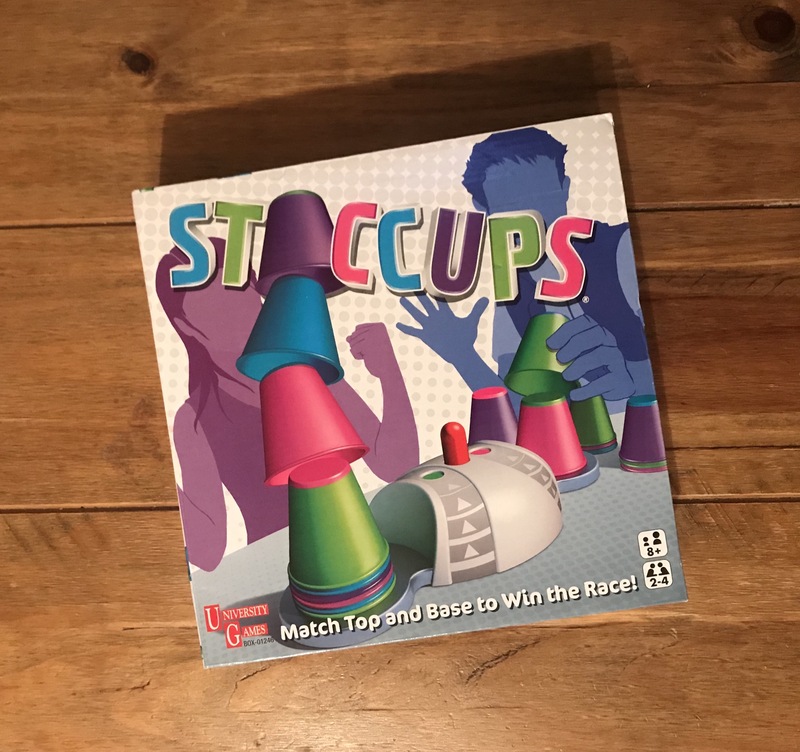 Staccups comes with a bit of a warning: it’s highly addictive and will bring out your competitive streak. 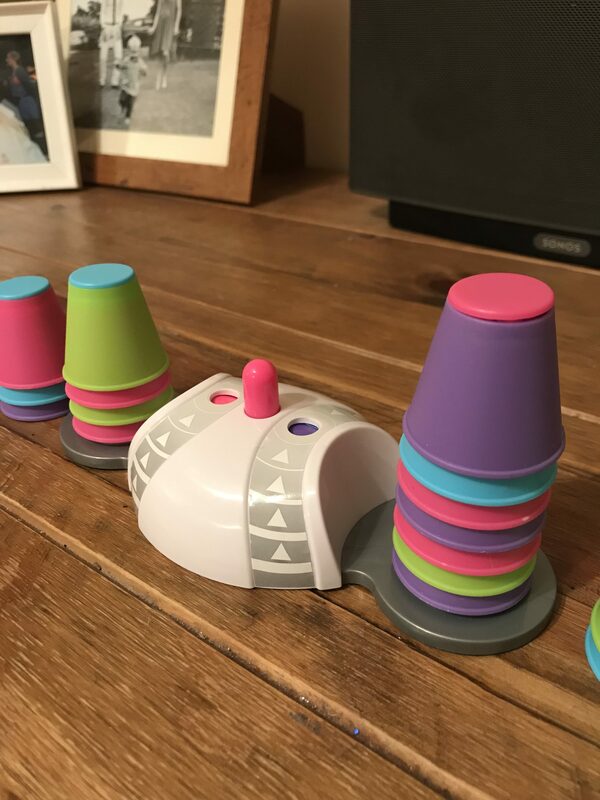 The object of the game is to stack your cups (hence the name) quicker than your opponent. Each cup is colour-coordinated, bottom and top. For instance, the top of the cup may be pink, while the bottom may be green. 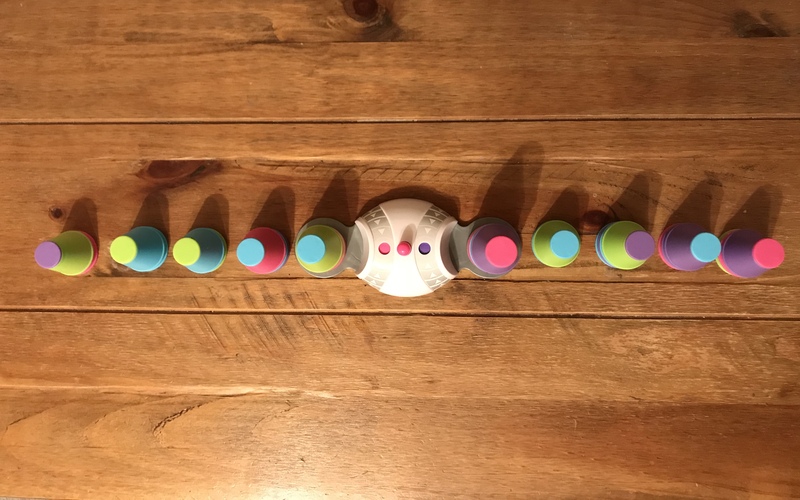 You then have to match the bottom colour to the top colour of the cup that has already been placed. Sounds pretty simple, but as the first thing that you look at is the top colour, it can get hysterically chaotic. The thing that we love about Staccups is that the whole family can play it. Jesse, who won’t be four until November, already practises colour sequences at pre-school and at home with us. Consequently, even at his tender age, he’s more than capable of taking part. It’s also great for working on hand-eye coordination so, again, it’s perfect fun for younger children. Don’t let any of this, however, lead you to think that this is a kid’s game. Nat and I will battle spectacularly over Staccups; it’s just one of those games, it really is. Just a little tip: don’t consume too much alcohol if you want to win. This is a game based on reactions so if, like me, you’re the competitive type, go easy. If, however, you’re up for pure, unadulterated, chaotic fun, play this after a few glasses of the good stuff. Staccups is so easy to transport, set up and play that it fits all the requirements for family camping games. There are only a limited number of pieces, all of which are tough enough for family tent use; the beauty of Staccups is in its simplicity. The second of our favourite family camping games is 5 Second Rule. This is another fast and frenetic game. If I asked you to name three breeds of dog right now, I’m pretty sure you’d easily manage it. However, as the name of the game suggests, doing this within the confines of five seconds alters these trivial questions somewhat. Add to this the element of competition, and what you have is a recipe for some uproarious tent fun. Cue ridiculous answers, and lots of them! 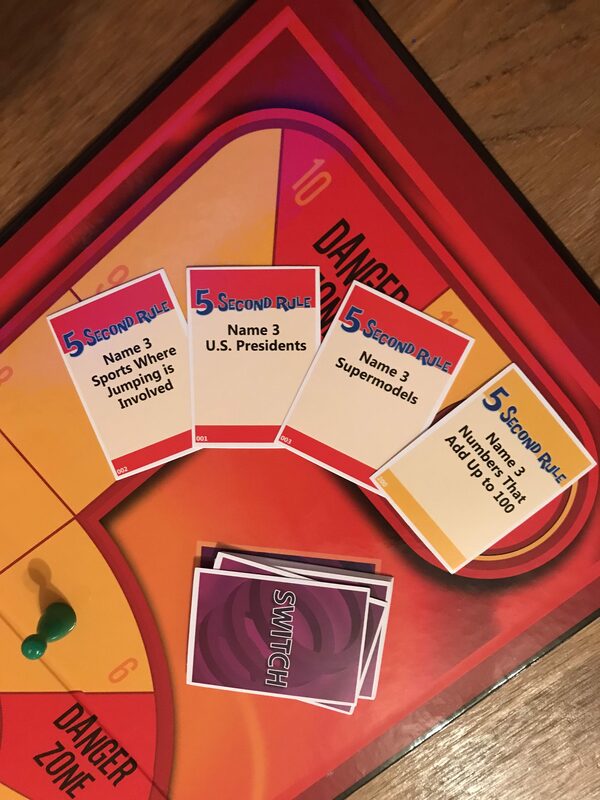 As this is a game for 3 – 6 players, it’s again one for the whole family to enjoy. 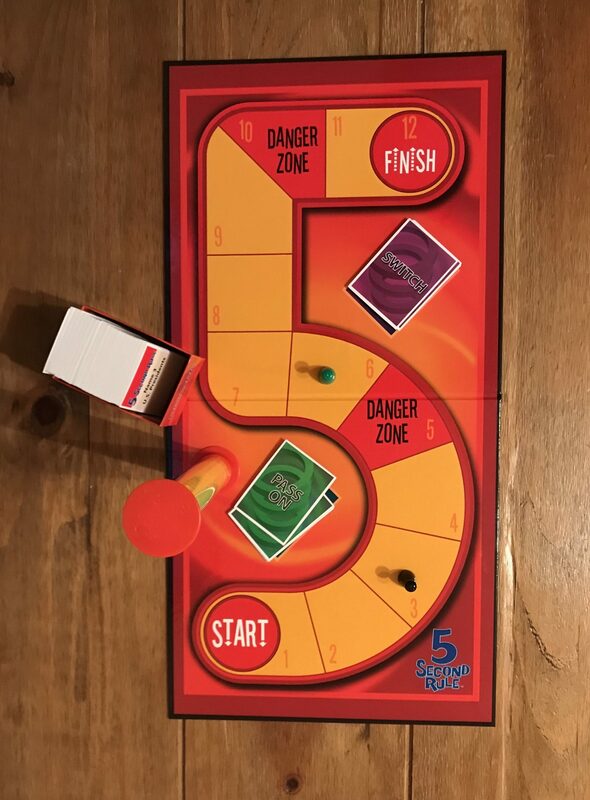 Although it’s designed for players aged 8+, it’s very easy to adapt questions for younger players too. As such, it’s not uncommon for us to use variations such as ‘name three zoo animals’ etc. Of course, you can also extend the 5 seconds (unless they start winning) for young children too. 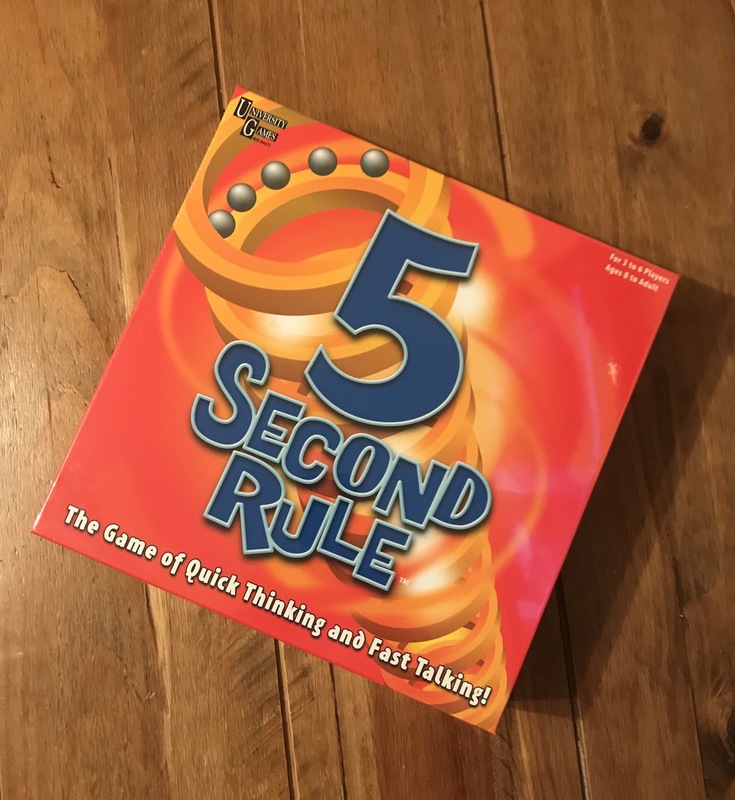 A lot of modern board games come with over-complicated rules and pieces that need a couple of days to get your head around; 5 Second Rule is the perfect antidote to this. Don’t think its simplicity adds up to fewer laughs, though. This particular family camping game is one that will have your neighbours wondering what you’re playing! If you have a couple of go-to family camping games, please let us know what they are. We’re always on the lookout for great ideas.